German carmakers have a reputation for solid performance and reliability. Their sports cars tend to be evolutions of their saloon cars. While motorsport is embedded in their DNA, the manufacturers seldom venture into the realm of the exotic sport car. Not Audi. In 2003, after some years dominating endurance racing, the marque announced its intention to establish a foothold in exotic sport cars by unveiling a concept car. 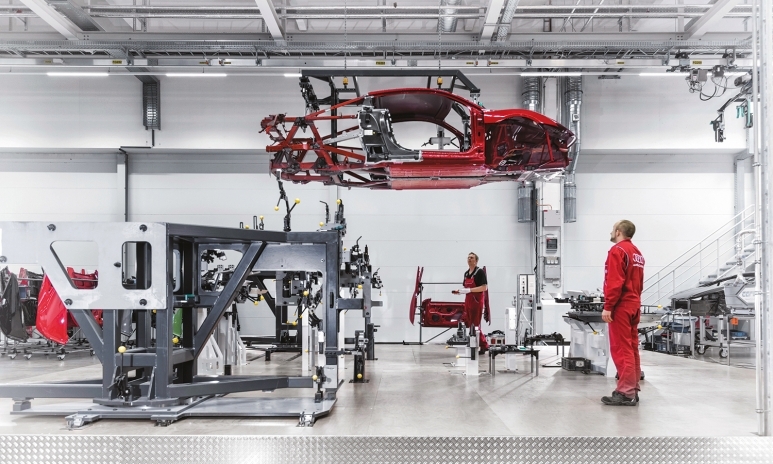 Three years later, Audi’s performance division, Quattro GmbH, delivered the R8 road car, which has been a roaring success, with more than 26,000 produced in the past 10 years. The R8 has received subtle upgrades over the years. It started life with a 4.2-litre V8 that produced 414bhp, 430Nm of torque and a 0-100km/h sprint of 4.6 seconds—supercar performance at the time. The V8 was later upgraded to a 5.2-litre V10 that knocked almost a second off the 0-100km/h dash. And now comes a new generation that pushes the boundaries. The “basic” 5.2-litre R8 V10 generates 533bhp and 540Nm of torque, delivering 0-100km/h in 3.5 seconds—with fuel efficiency 13 per cent better than the previous generation. If that’s not enough, there’s also the V10 Plus, which boosts power to 602bhp and torque to 560Nm, cutting the 0-100km/h dash to 3.2 seconds. The V10 Plus is immediately identifiable by the carbon-fibre rear wing, which generates 140kg of downforce at the R8’s top speed of 330km/h—the highest top speed of an Audi road car. Unfortunately I don’t have access to a racetrack to test it on the day I take the V10 Plus for a drive. 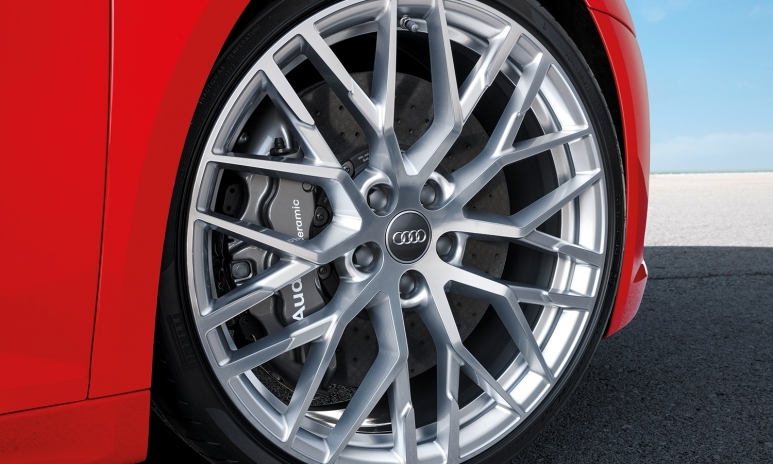 Other additions over the regular V10 include ceramic brake discs and three more performance modes—for dry, wet and snow conditions—to adapt the car’s electronics to the conditions or your mood. There’s also stiffer, sportier suspension and a plethora of aesthetic detailing in carbon fibre, inside and out, to differentiate the Plus from the regular R8. Another distinction becomes apparent as I settle behind the wheel. The bucket seats have few of the creature comforts you may have come to expect. The distance from the pedals is adjusted manually rather than electrically. The seat back can be electrically adjusted, but that’s it; there are no side bolsters or gadgets to adjust seat length, angle or lumbar support. It’s refreshing in a way because I don’t sit for 10 minutes fiddling with dozens of buttons. A quick adjustment to the side mirrors—which are thankfully still electric—and I pilot the V10 Plus out into the mid-morning traffic of Hong Kong Island. First impressions are good. The sound of the naturally aspirated V10 is very welcome, although a little remote as the cabin is particularly well insulated from the outside environment. All-round visibility is good, although a shorter driver may find it wanting, given the seat’s lack of height adjustment. The sports suspension and minimal seat padding would not make for great comfort over long distances. The car is very tractable in the city traffic. The throttle response is immediate, thanks to the normally aspirated engine and the highly developed dual-clutch transmission, which executes excellent shifts in both automatic and manual mode. 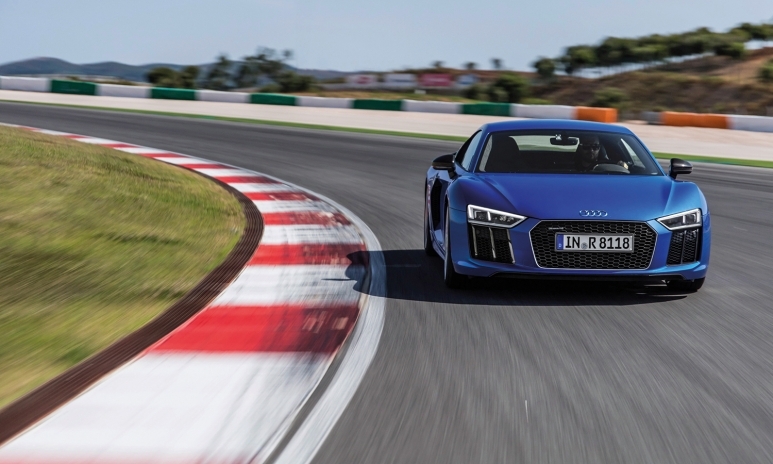 A fuel-saving feature also bears mentioning: if you take your foot off the accelerator pedal while travelling at more than 55km/h, both clutches disengage and the R8 goes into coasting mode. The instrument panel has a variety of modes and will appeal to the Playstation generation. Traditional round gauges can be replaced by a map when navigation requires. There is also a power and torque display, but it’s not directly in my line of vision—and my eyes would be glued to the road and slower vehicles if accelerating hard. The all-wheel-drive has a tendency to understeer in long, sweeping turns, but that’s easily corrected with the ample power available. The bucket seats also allow a significant amount of feedback from the car. As the drive progresses, the car is giving me the impression it’s only begrudgingly adapting to life on urban roads and would be only too keen to show the extent of its abilities on a racetrack. 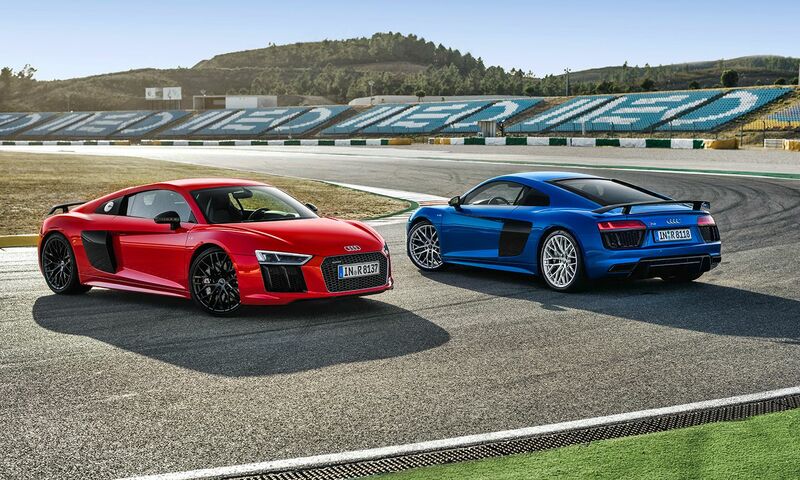 With the new R8, Audi’s ambitions as an exotic car manufacturer are fully realised and perhaps exceeded. The performance of the V10 Plus leaves nothing to be desired and will be a joy to those with regular access to roads without speed limits. However, you might want to consider the regular V10 as an alternative if the additional race-going technology and aesthetics are not of ultimate concern. The combination of performance, usability and resolutely Teutonic aesthetics possessed by both versions will appeal to a legion of sports car enthusiasts.